The apostle Thomas also didn’t expect God to bring good out of the greatest challenge of his faith—Jesus’s crucifixion. Thomas wasn’t with the other disciples when Jesus came to them after the resurrection, and in his deep grief he insisted, “I won’t believe it unless I see the nail wounds in his hands [and] put my fingers into them” (John 20:25). But later, when Jesus appeared to all the disciples together, out of the dust of Thomas’s doubts God’s Spirit would inspire a striking statement of faith. When Thomas exclaimed, “My Lord and my God!” (v. 28), he was grasping the truth that Jesus was actually God in the flesh, standing right in front of him. It was a bold confession of faith that would encourage and inspire believers in every century that followed. God can change our doubts into bold statements of faith. He Is Risen / Holy Week / Day 8: Surprised! He Is Risen | Day 8: Surprised! Suddenly, their eyes were opened, and they recognized him. Luke, who records these events in his gospel, tells us that the two men immediately returned to Jerusalem where they found the eleven disciples and others assembled together and saying, “ ‘The Lord has really risen! He appeared to Peter.’ Then [they] told their story of how Jesus had appeared to them as they were walking along the road, and how they had recognized him as he was breaking the bread” (vv. 33–35). To find the Lord Jesus Christ we must be willing to seek Him. One day in physics class many years ago, our teacher asked us to tell him—without turning around—what color the back wall of the classroom was. None of us could answer, for we hadn’t noticed. Sometimes we miss or overlook the “stuff” of life simply because we can’t take it all in. And sometimes we don’t see what’s been there all along. It was like that for me as I recently read again the account of Jesus washing His disciples’ feet. The story is a familiar one, for it is often read during Passion Week. That our Savior and King would stoop to cleanse the feet of His disciples awes us. In Jesus’s day, even Jewish servants were spared this task because it was seen as beneath them. But what I hadn’t noticed before was that Jesus, who was both man and God, washed the feet of Judas. Even though He knew Judas would betray Him, as we see in John 13:11, Jesus still humbled Himself and washed Judas’s feet. Lord Jesus Christ, fill my heart with love that I might roll up my sleeves and wash the feet of others for Your glory. Because of love, Jesus humbled Himself and washed His disciples’ feet. It was our weaknesses he carried; it was our sorrows that weighed him down. I suppose many discouraged people feel that way about the world today and the people in it. But when it comes to the perplexities and concerns of our lives, Jesus fully understands, and He deeply cares. Isaiah 53, an Old Testament prophecy of the crucifixion of Jesus, gives us a glimpse of what He went through for us. “He was oppressed and treated harshly . . . . He was led like a lamb to the slaughter” (v. 7). “He was struck down for the rebellion of my people” (v. 8). “It was the Lord’s good plan to crush him and cause him grief. Yet when his life is made an offering for sin, he will have many descendants. He will enjoy a long life, and the Lord’s good plan will prosper in his hands” (v. 10). 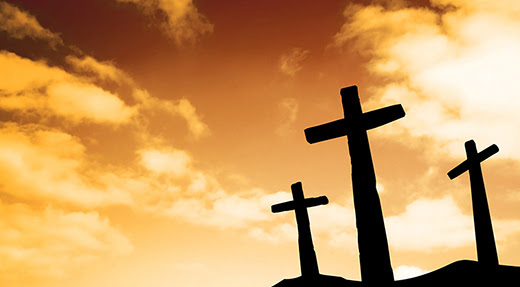 INSIGHT: Can you imagine being personally responsible for the crucifixion of Jesus? Luke tells us the Roman centurion saw something that led him to conclude that he had just overseen the execution of an innocent man (Luke 23:47). Matthew adds that as the officer and his soldiers felt the earth shake violently under their feet they became terrified at the thought that they had just executed “the Son of God” (Matthew 27:54). In their world, Caesar was known as the son of God. But these Roman soldiers suddenly realized the emperor they answered to was nothing like Jesus. Entrusted with all power and authority in heaven and on earth, His death revealed the loving heart of His Father. Imagine being the centurion reading what the apostle Paul later wrote to followers of Jesus in Rome. By this time, Jesus’s death was being proclaimed as good news to everyone (Romans 1:15-17). Paul described Jesus’s suffering and death as evidence of the God who continues to groan with us in our wrongs against Him, one another, and ourselves (Romans 8). Researchers ran the test on dozens of pairs, and found consistent results. When a person was alone or holding a stranger’s hand while anticipating a shock, the regions of the brain that process danger lit up. But when holding the hand of a trusted person, the brain relaxed. The comfort of a friend’s presence made the pain seem more bearable. Jesus needed comfort as He prayed in the Garden of Gethsemane. He knew what He was about to face: betrayal, arrest, and death. He asked His closest friends to stay and pray with Him, telling them that His soul was “crushed with grief” (Matthew 26:38). But Peter, James, and John kept falling asleep. Jesus faced the agony of the garden without the comfort of a hand to hold. But because He bore that pain, we can be confident that God will never leave or forsake us (Hebrews 13:5). Jesus suffered so that we will never have to experience separation from the love of God (Romans 8:39). His companionship makes anything we endure more bearable. There’s something special about the comfort of others who have experienced our pain. They know. Just before Jesus’s arrest, He warned His disciples, “You will weep and mourn . . . but the world will rejoice.” Yet in the next breath He comforted them: “You will grieve, but your grief will suddenly turn to wonderful joy” (John 16:20). In mere hours, the disciples would be devastated by Jesus’s arrest and crucifixion. But their crushing grief soon turned to a joy they could not have imagined when they saw Him alive again. Isaiah prophesied of the Messiah, “It was our weaknesses he carried; . . . our sorrows that weighed him down” (Isaiah 53:4). We have a Savior who doesn’t merely know about our pain; He lived it. He knows. He cares. One day our grief will be turned into joy. He bore the sins of many. We might feel the pain of being separated from loved ones, but Jesus felt the ultimate separation when He paid the price of love on the cross. He, who was both human and God, fulfilled Isaiah’s prophecy 700 years after Isaiah gave it when He “bore the sins of many” (Isaiah 53:12). In this chapter we see rich pointers to Jesus being the suffering Servant, such as when He was “pierced for our rebellion” (v. 5), which happened when He was nailed to the cross and when one of the soldiers pierced His side (John 19:34), and when “he was whipped so we could be healed” (Isaiah 53:5). Jesus was the perfect sacrifice who died to give us life. What joy for those whose disobedience is forgiven, whose sin is put out of sight! When Jesus came to this world, John the Baptist called Him “the Lamb of God who takes away the sin of the world!” (John 1:29). We need our sin taken care of because it separates us from God whose character and ways are always perfect and right. 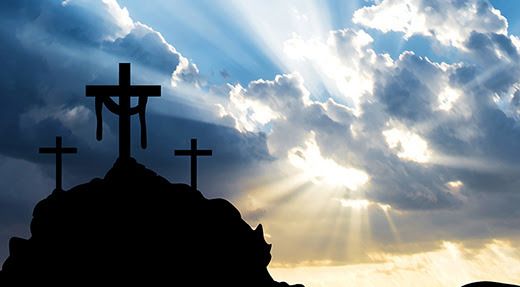 Because His love for us is great, God made His Son Jesus “who never sinned, to be the offering for our sin, so that we could be made right [righteous] with God through Christ” (2 Corinthians 5:21). Jesus, the Lamb, sacrificed Himself and shed His blood. He became our “cover.” He makes us righteous, which places us in right relationship with God. “I’m not surprised you lead retreats,” said an acquaintance in my exercise class. “You have a good aura.” I was jolted but pleased by her comment, because I realized that what she saw as an “aura” in me, I understood to be the peace of Christ. As we follow Jesus, He gives us the peace that transcends understanding (Philippians 4:7) and radiates from within—though we may not even be aware of it. Jesus promised His followers this peace when, after their last supper together, He prepared them for His death and resurrection. He told them that though they would have trouble in the world, the Father would send them the Spirit of truth to live with them and be in them (John 14:16–17). The Spirit would teach them, bringing to mind His truths; the Spirit would comfort them, bestowing on them His peace. Though soon they would face trials—including fierce opposition from the religious leaders and seeing Jesus executed—He told them not to be afraid. The Holy Spirit’s presence would never leave them. Although as God’s children we experience hardship, we too have His Spirit living within and flowing out of us. God’s peace can be His witness to everyone we meet—whether at a local market, at school or work, or in the gym. When we keep our mind on God, His Spirit keeps our mind at peace. If the Son sets you free, you are truly free. Olaudah Equiano (c. 1745–1796) was only 11 years old when he was kidnapped and sold into slavery. He made the harrowing journey from West Africa to the West Indies, then to the colony of Virginia, and then to England. By the age of 20 he purchased his own freedom, still bearing the emotional and physical scars of the inhumane treatment he had experienced. Unable to enjoy his own freedom while others were still enslaved, Equiano became active in the movement to abolish slavery in England. He wrote his autobiography (an unheard of achievement for a former slave in that era) in which he described the horrific treatment of the enslaved. When Jesus came, He fought a battle for all of us who are enslaved and unable to fight for ourselves. Our slavery is not one of outward chains. We are held by our own brokenness and sin. Jesus said, “Everyone who sins is a slave of sin. A slave is not a permanent member of the family, but a son is part of the family forever. So if the Son sets you free, you are truly free” (John 8:34–36). Wherever such a freedom seems unheard of, His words need to be declared. We can be liberated from our guilt, shame, and hopelessness. By trusting Jesus, we can be free indeed!